Diane Briars, past president of both NCSM and NCTM, was honored at the NCSM Annual Meeting in Washington, D.C. on April 25, 2018 at the final conference luncheon with the Ross Taylor/Glenn Gilbert National Leadership Award. Please visit HERE for a video describing the significant contributions Diane Briars has made as a mathematics leader and for more information about the Ross Taylor/Glenn Gilbert National Leadership Award. This and other awards are now open for nominations. Please see the article to the right for additional information about the NCSM Awards Program. The Presidential Awards for Excellence in Mathematics and Science Teaching (PAEMST), the nation’s highest honor for teachers of mathematics and science (including computer science) were recently announced! PAEMST is awarded annually to exceptional K-12 educators throughout the nation. NCSM is proud to be represented among these excellent teachers! Two NCSM members were selected as PAEMST Awardees: Anne Marie Nicoll Turner (Michigan) and Denise Marie Rawding (New Jersey). Visit HERE to read their biographies and learn more about them. Join us for the Collective Call to Action's next book discussion for July - August. A webinar will be held in September 2018 (date TBD) and will be facilitated by the Association​ ​of​ ​Mathematics​ ​Teacher​ ​Educators​ ​(AMTE)​. The American Statistical Association (ASA) wants to invite you to attend a Meeting Within a Meeting (MWM) Statistics Workshop for Middle and High School Mathematics and Science Teachers, which will take place on July 31–August 1, 2018 in Vancouver, BC, Canada. The workshop is offered by ASA and the National Council of Teachers of Mathematics (NCTM) Joint Committee on Curriculum in Statistics and Probability in conjunction with the Joint Statistical Meetings (JSM) 2018 in Vancouver, BC, Canada, though registration for JSM is not required. The workshop programs (grades 5-8 and 9-12) are posted online. Registration is just $50, and the ASA will refund $50 to the first 30 teachers/supervisors who register and attend. Teacher educators, supervisors, and pre-service teachers are also welcome. Registration will be open until July 16 or until the course fills, but a limited number of scholarships and reimbursements are available, so act quickly and register soon. The MWM program is posted online. For those interested in extending your mathematics learning and networking experience, you will want to check out the Colorado Council of Teachers of Mathematics conference which will be held on August 2-3 at the University of Denver, about 15 minutes away from where the NCSM Summer Leadership Academy is located. Two conferences in one week! What a wonderful opportunity! You can check out the Conference Program and register for the conference HERE. Summer is almost halfway over and we are beginning to think about the new school year. As your NCSM Board gathered at our summer board meeting last month, we continued the discussion on what we can do to make sure your membership is always of service to you throughout the year. 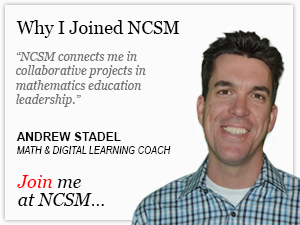 I would like to highlight just a few of the current benefits of an NCSM membership. Links to all of these benefits are found HERE. Pedro Noguera's Keynote address, "Equity and Deeper Learning in Mathematics", delivered at the 2018 Annual Meeting in Washington, D.C. is now available as a video for NCSM members. Clicking on this VIDEO LINK will prompt you to log in with your membership information. (Note that the video is 47 minutes long.) It is great to hear Pedro again if you were at the conference or, for the first time, if you were unable to join us this year. Another value of membership includes reduced rates at the leadership academies and seminars. There is still time to join us for the Building Mathematics Leadership: Coaching Summer Leadership Academy at the end of July in Denver, Colorado. See the article below or visit HERE for more information on this year's academy. Look for information to come in the near future about the valuable fall seminars to be held in Hartford, CT on October 4, 2018 and in Seattle on November 28, 2018. The position papers provide information and suggestions on focused topics. Most recently we have the papers on Building STEM Education on a Sound Mathematical Foundation and Computer Science and K-12 Mathematics. The STEM position paper was a joint effort with NCTM, so you will find a webinar from me and NCTM President, Robert Berry III, in the same location as the position paper. Multiple electronic resources arrive in your email. I personally find the Marshall Memos amazing and they arrive to your email box on a regular basis, usually every Tuesday. There is so much overwhelming information on the Internet and in the news that these electronic resources help us to focus on information relevant to our work. Another resource is the eNews (this vehicle) that comes into your email box around the 15th of every month. Look beyond the articles to the gems of resources and opportunities from NCSM and other organizational partners. Our periodicals include the NCSM Newsletters which are published four times a year - fall, winter, spring, summer - and are now in an electronic, interactive format. We send you a notification when the newsletter is ready for your perusal. The NCSM Journal is published twice yearly - in the spring and fall - and is mailed to members of NCSM only. They are not available by subscription so this is a benefit for you as a member. There are also several Monographs available to NCSM members. All of these periodicals, both past and current, can be found HERE. There are multiple publications for purchase. We have Prime, It’s Time, and Great Tasks for purchase. Three new publications are underway and I will provide you with more information on these in the next few months. You can purchase NCSM publications at the NCSM Shop Online. Have you really looked at our website recently? There is a variety of tools we hope you will find useful. Jumpstart (research-based formative assessment information), Tasks in Three Acts (tools with videos), Mathematical Trajectories PowerPoint, and the NCSM Career Center to just name a few of the resources you will find. Have you explored the Coaching Corner and all of the ways the information could help? I challenge you to find each of the resources mentioned above on our website and explore what rich resources they are. And have I mentioned the networking opportunities? These start with the conferences but do not end there. Our new software has circles that enable our RD’s to reach out to their regions and we have used them to provide more information and interactions. Our members are one of our most valuable resources. We learn from each other and we advance the learning for our students. Starting in August, to help you discover more about the rich resources on the website and our other benefits, the eNews will feature a different benefit each month. Look for a guided tour of an NCSM benefit each month! I am honored to continue to volunteer for NCSM on this journey as president. Please reach out when you have an idea or way to work with us as we plan bold leadership in mathematics education. Make sure your email information is correct and your membership is up to date. Watch for the voting announcements in the mail and online; you should receive a postcard with voting instructions in mid-August. Voting will begin on September 15th and end on October 15th. Please visit HERE for more information on the Ross Taylor/Glenn Gilbert National Leadership Award and for a nomination form and criteria. Nominations are open through November 1, 2018. See sidebar article on the 2018 Ross Taylor/Glenn Gilbert National Leadership awardee, Diane Briars. There is Still Time to Register for the NCSM Summer Leadership Academy: "Building Mathematics Leadership: Coaching"!